We are all familiar with the amazing quality that Swiss watches have to offer. Now, thanks to François Zahnd and Rolf Bodmer, a revival of Votum Swiss Mechanical Watches is taking place on Kickstarter. Built around three essential principles, Votum has a style and class of its own. Those principles are minimalist in design, high quality in production, and, of course, generally inexpensive. Simple, elegant and refined, for the man that has exceptional taste. 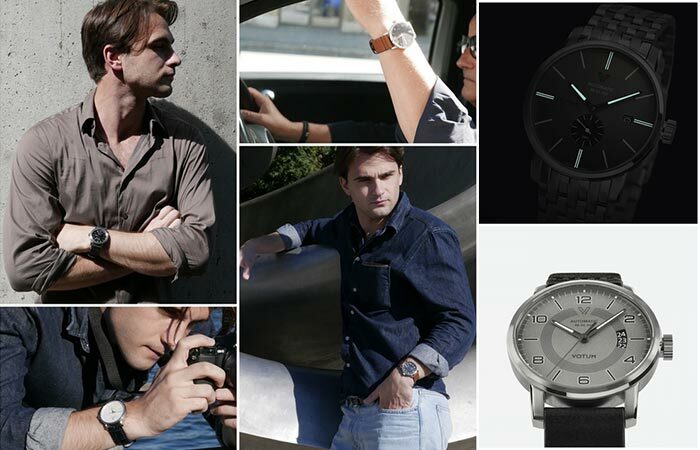 Votum is essentially a new mechanical watch collection that features 4 unique and distinct styles for the classy man. Simple, elegant and refined, are the qualities that best describe Votum. Check out the introduction video below. 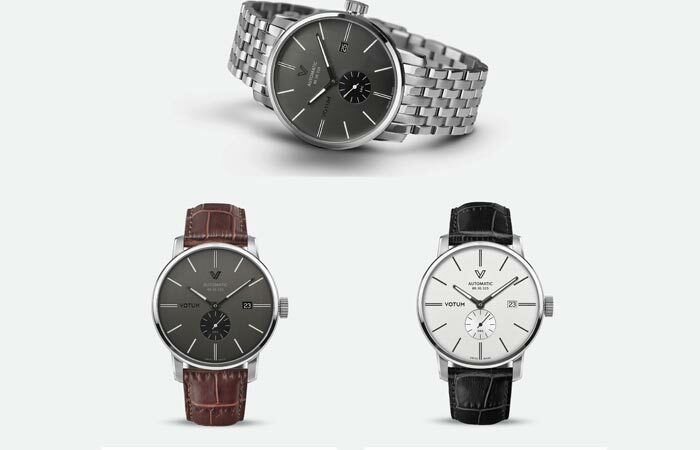 The first style is the ‘Heritage’ which is a revamp of the original Votum Heritage model that was built in the 1960’s. It’s classical with a twist. It features a stainless steel case, ETA 2824-2 Swiss made movement, Sapphire crystal window, Swiss SuperLuminova Hands and Dial, 10 ATM Water Resistance, a screwed case back, and your choice of stainless steel bracelet or a genuine leather strap. The Heritage model features a classic design with a unique twist. The next on the list is the ‘New Classic’ which is a revival of the classical watch. The ‘New Classic’ features an augmented style that was designed to stand the test of time. It features the same qualities as the ‘Heritage’ with the addition of 3 dates display system. 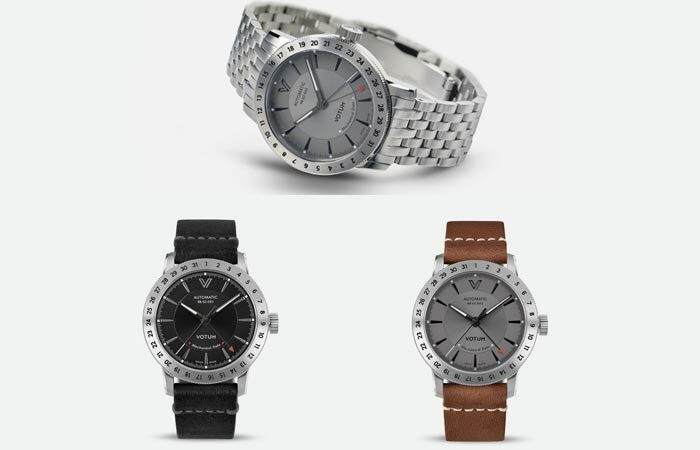 You can also have your selection of a stainless steel bracelet or genuine leather strap. 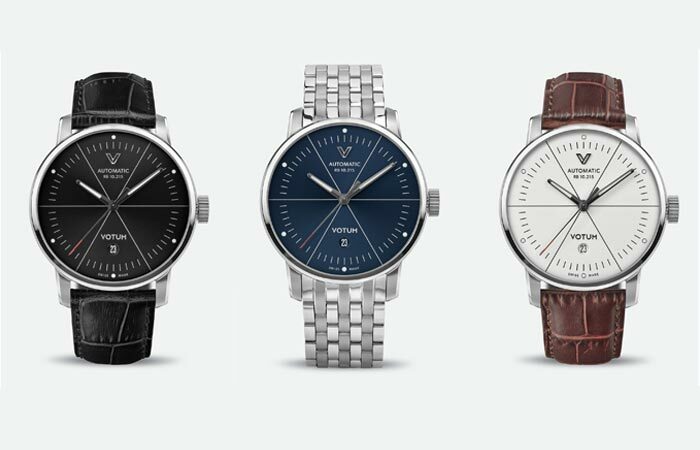 The New Classic features three distinct models that come with your selection of either a stainless steel bracelet or a genuine leather strap. Refined and classy, the next on our list is the ‘Elegance’. It builds further onto the qualities of the ‘Heritage’ and the ‘New Classic’ and replaces the 3 date display system with a single date display. However, it also has the added addition of a small second display at 6 o’clock. Furthermore, it replaces the ETA 2824-2 movement with a Sellita SW260 Swiss Movement. 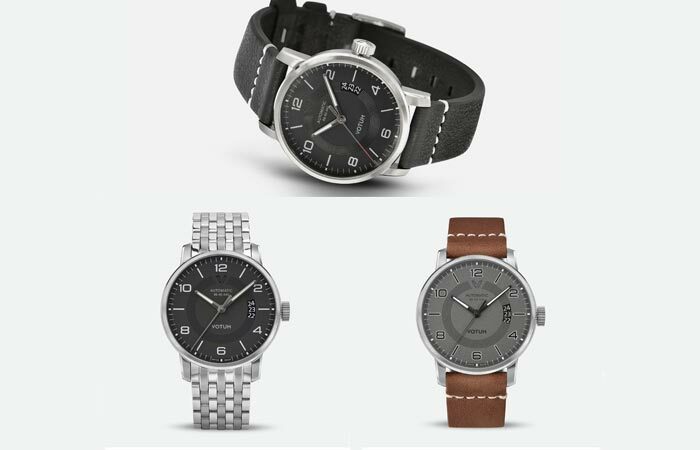 The ‘Elegance’ Collection features three stylish watches for the man with refined tastes. In addition, Votum introduces the ‘Mechanical Date’ model. It further builds upon the qualities of the other models. However, it is enhanced with another feature that is the prime of unicity. This watch features a rotating bezel that acts as the date system. Essentially, it allows you to easily set the date from the 30th to the 1st of a new month in one easy movement. It also features another movement system, the Sellita SW221. The Mechanical Date Collection has an incredibly unique feature. The rotating bezel functions as the primary date keeping system and is also very easy to set. Furthermore, you also have a selection of colors and different styles when it comes to the genuine leather straps.